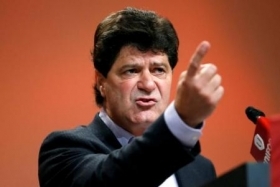 Unifor President Jerry Dias says talks with Ford are painfully slow. Ford Motor Co. and Unifor are “close to a deal,” the union said on Twitter just minutes following the midnight strike deadline. “Negotiations continue w #Ford,” the tweet reads. “The union is close to a del. All efforts are being made 2 keep our mbrs at work & secure the pattern”. Ford and Unifor were engaged in “high-level discussions” late Monday night as the two sides sought to reach a tentative labor deal. Unifor spokeswoman Denise Hammond, briefing reporters at 10 p.m. in Toronto, said local issues remain outstanding in addition to “key economic commitments” and investments. Ford is balking at the pattern set by contracts with General Motors and Fiat Chrysler Automobiles, Hammond said. Should no deal be reached by 11:59 p.m. EDT, Ford workers represented by Unifor will strike the automaker. “With the final two hours remaining, the fate is in the employer’s hands,” Hammond said. Hammond said Ford has proposed several “offsets” to help reduce the costs of the pattern deal, including the introduction of temporary full-time workers who would be paid less than their permanent counterparts and changes to workers’ long-term health care plans. She said Unifor would not accept such proposals. In an earlier update, Hammond said talks with Ford have been more difficult than those with GM and FCA, but she said the union remains “cautiously optimistic” that a deal will be reached before the strike deadline. Without a deal by the deadline, some 6,700 Canadian Ford workers represented by Unifor will go on strike, the union said. It would be the first strike by Canadian workers against a Detroit Three automaker since 1996, when workers walked out on GM. Unifor’s top priority in negotiations with Ford is securing investments at two Windsor, Ont., engine plants, which build V-8 and V-10 engines for the Ford F-150 and Ford Mustang, among other nameplates. A strike would halt output of the four crossovers Ford produces at the Oakville, Ontario, assembly plant: The Ford Edge, Ford Flex, Lincoln MKT and Lincoln MKX. Ford has 76 days of inventory of the Edge, 78 days of Flex, 98 days of MKT and 106 days of MKX. Unifor President Jerry Dias, speaking with Automotive News late last week, said Ford has been particularly concerned with the changes to the 10-year wage grow-in period for new hires. Under the GM and FCA contracts, new hires receive pay raises each year, eliminating the three-year wage freeze under the previous agreements. That could prove costly for Ford, because it hired about 1,000 hourly workers beginning in 2014 in Oakville, which received a $700 million investment from the automaker in 2013. “Since we ratified the deal with GM, they have been voicing their displeasure with the [wage] grid because they have more employees on the grid than the other two do,” Dias said. If a deal is reached Monday, Unifor members at Ford plants will vote on whether to ratify the pact this weekend. Unifor could face a significant hurdle in persuading members at the Oakville plant to sign onto an agreement, as local leadership has indicated a deal patterned on the GM and FCA contracts might not pass there. That has not set well with Unifor Local 200, which represents workers at the Windsor engine plants. In an update posted late Sunday on its Facebook page, the local accused Local 707 in Oakville of “gambling” on the future of the automaker’s Canadian manufacturing footprint. Dave Thomas, president of Local 707, said in early October the pattern set by the GM and FCA deals would not be ratified by workers at Ford’s Oakville plant, citing higher expectations from workers on wages and economics. Dias last week denied that there was any “rift” between union leadership and the Oakville local. Unifor has scheduled media briefings at 8 p.m., 10 p.m. and midnight EDT Monday.